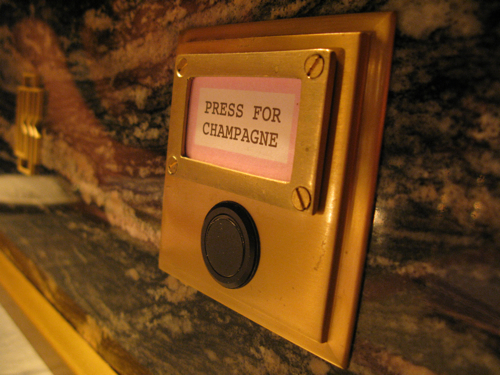 If I had all the money in the world, I would install one of Bob Bob Ricard’s infamous gold-plated “Press for Champagne” SOS buttons smack beside my living room couch. Fine, its a little outrageous and bordering on ostentatious… but absolute genius and a whole lot of fun at the same time. I was extremely curious as to what would happen upon pressing it. Would sirens go off? Would bubbly magically pour out of the wall? In reality, it’s not all that different to the call-out button you get on an airplane… a cheery waitress will swing by your table in a flash to ask the rhetorical question of whether you would like some champagne. And after reading BBR’s cheeky price comparison taglines throughout their winelist which mock Gordon Ramsay and The Ivy for charging almost double for the exact same glass of champers, its a no-brainer. Of course I would like some bubbly please. To press or not to press, that is the question. There really is a sense of decadence here that extends beyond this button. Everything from the black marble walls with gold in-lays to the emerald green dining booths sings of a golden era where vintage wines, caviar and lobster were staples of everyday life. The food here is one of a kind… an eclectic mix of classic British and Russian cuisine, featuring everything from Prawn Cocktail and Beef Wellington to Varynyky and Jellied Ox tongue. 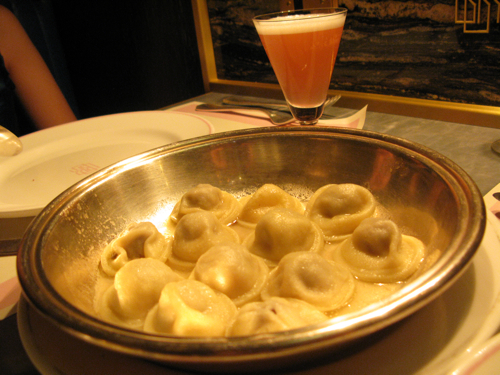 To start, we had one of BBR’s Russian specialities – Meat Pelmeni, served with white vinegar and sour cream. The concept of these steamed dumplings are very similar to that of a Xiao Loong Bao you get at dim sum joints. Stuffed with juicy minced meat and filled with a sweet flavoursome broth which burst in the mouth with the first bite, it was nourishing, comfort food for a cold February night. Jo’s Chateaubriand, though steep price-wise, was a real beauty. 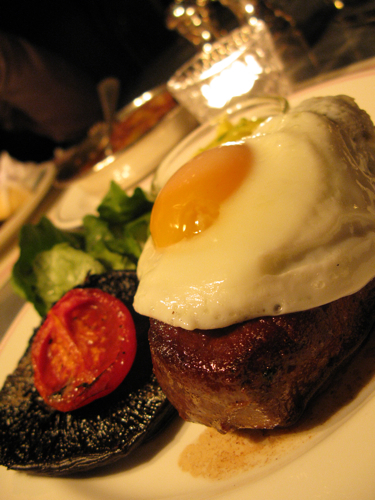 The beef fillet steak which must have been taller than an inch in height was cooked clinically to medium rare perfection and melted in the mouth like butter. I did find the double hit of creamy bearnaise and still runny egg-yolk rather rich, especially after the first few mouthfuls. A delectable, timeless classic nonetheless. After reading blogpost after blogpost about the much raved about Veal Holstein, it was going to be difficult to order anything else. I’m happy to report that it really does taste as good as it looks. 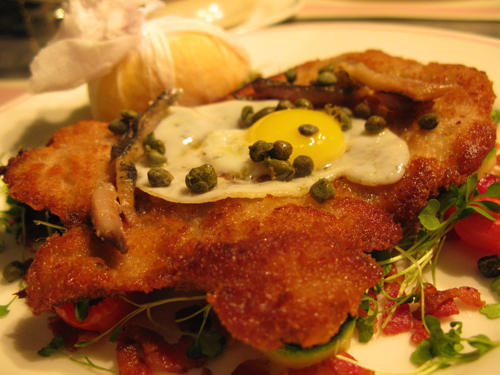 The crisp, juicy breaded veal was wonderfully balanced by the richness of the yolk, the zingy acidity from the capers and earthy savouriness of the anchovies. A bed of truffled mash and truffle jus weighed in boldly to provide some class. This was without a doubt, my favourite dish of the evening. 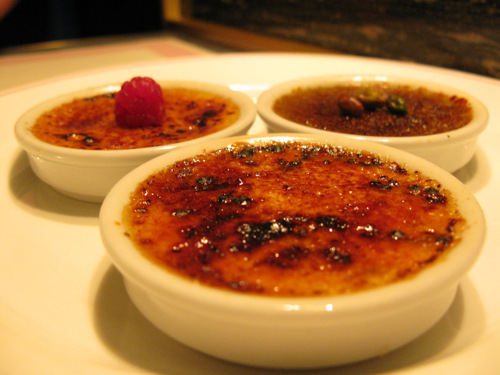 Our trio of Pistachio, Passion fruit and Classic Vanilla Creme brulees which we ordered to share wasn’t exactly mindblowing, but decent enough to bring proceedings to a happy end. On the whole, I really liked BBR and can definitely see myself coming back. If you exercise some restraint on the Champagne button, dinner for 2 including a glass of bubbly each would set you back by just over £100 in total. Yes, it’s dear, but few places will match the wow-factor you get here at BBR. It’s wacky, it’s eccentric but oh so much fun. Hats off to them for daring to be different. There are a few things to celebrate this week. I think you’ve inspired me to try and swing past this weekend. Press for champagne! Tori: Tx for stopping by – Let me know how BBR goes for you if you end up swinging past. The button is ingenious =P.